Today marks the launch of the LEGO Ideas: Ship in a Bottle, exclusively available from LEGO Stores & shop.lego.com, and to celebrate its arrival the model took centre stage alongside the UK’s largest Ship in a Bottle. Created by Turner Prize nominee Yinka Shonibare MBE, the detailed, scaled-down replica of Nelson's HMS Victory is on permanent display at the National Maritime Museum, Greenwich. Created by LEGO fan designer Jake Sadovich, the design was inspired by an actual ship in a bottle that he had built a few years earlier, taking on the challenge of recreating his original piece through his passion for LEGO bricks. Available from today, the 962 piece model comes complete with an intricately designed ship, grandly named ’Leviathan’. The ship features a multitude of traditional nautical elements including, decorated compass, a captain’s quarters, 6 cannons, 3 masts, a crow’s nest, a raised deck at the stern, as well as printed sails and the ship’s own individual flag. Measuring over 3" (10cm) high, 12” (31cm) wide and 3” (10cm) deep, the LEGO brick-built model features a detailed, buildable cork with a NEW wax-seal-style element to avoid any unwanted leaks whilst floating on the seven seas, and over 280 translucent-blue water elements inside. 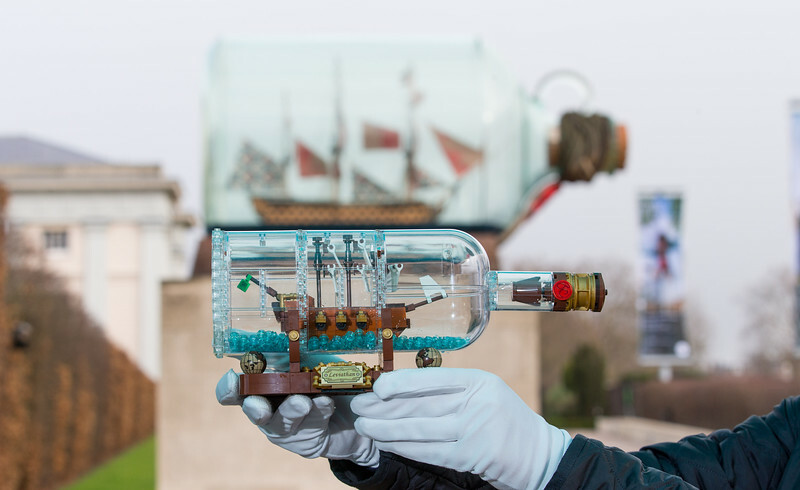 New LEGO Ideas: Ship in a Bottle showcased alongside the UK’s largest Ship in a Bottle – Yinka Shonibare MBE’s replica of Nelson’s HMS Victory - on permanent display at the National Maritime Museum, Greenwich, London. LEGO Ideas offers fans the opportunity to put forward their LEGO creation ideas to be in with the chance to have their concept brought to market with the help of LEGO master designers. The latest LEGO Ideas model is available exclusively at LEGO Stores and shop.LEGO.com from today.